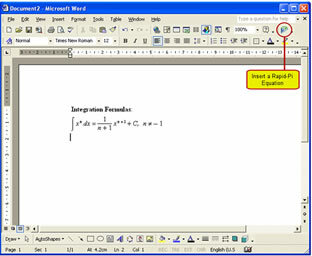 Rapid-Pi allows you to enter mathematical expressions as easy-to-understand text. For example, you can type "2/3" to create a fraction or type "x^2" to get x-squared. Rapid-Pi was designed with a single purpose in mind - to save you time when editing math in documents. Rapid-Pi's text-based input is a simply faster way to input math.